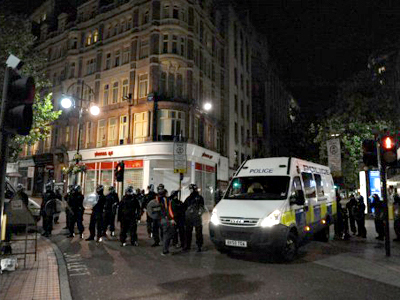 Some 16,000 police officers patrolling the streets of London on Monday night failed to prevent rioting completely. But with the upcoming austerity measures affecting the force, the number of officers on duty is bound to decrease in the future. 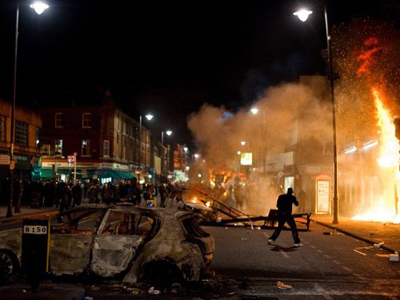 The British capital was shut down early last night over fears of more violence. People were sent home early from work, pubs and shops were locked up. The random violence in the UK saw its fourth day. 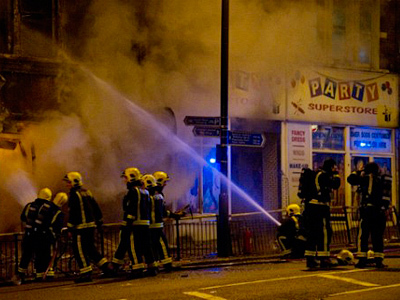 The worst-hit areas of south London appeared to be calm overnight, but skirmishes and arson attacks have broken out in Manchester, with a large group of youths throwing missiles at the police. Overall the intensity of the rioting has decreased, but more regions of the country have been affected. Disturbances have been reported in Manchester, Liverpool, and Birmingham in addition to London. 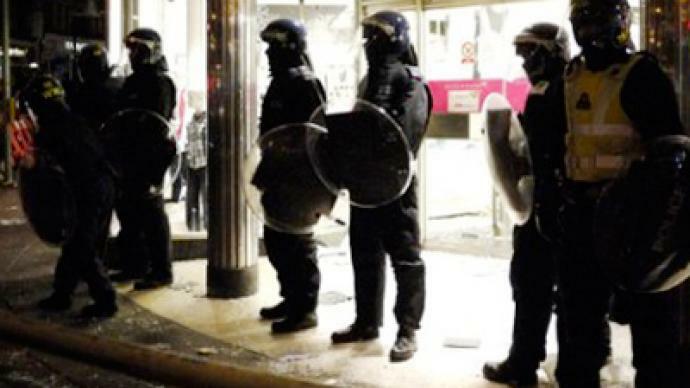 Some 450 people have been arrested all over the country for taking part in the riots. Police resources are not enough to bring the situation under control, but citizens are organizing themselves to fend off the pillaging crowds. London mayor Boris Johnson has visited riot-devastated Clapham in south London to a distinctly mixed reception, during which he attempted to deliver the government’s message to rioters that they will feel the full force of the law. “Tonight we are going to have a huge number of police on the streets,” he said. But who is going to catch the rioters? Across England and Wales, more than 11,000 police have already been laid off in austerity measures. By 2015, a total of 34,000 will have gone. Meanwhile, London and other cities have been taken over by thugs. While police numbers are being cut, the estimated cost of the war in Afghanistan from 2001 to the end of last month was $30 billion – of taxpayers’ money. British forces are also heavily involved in Libya, despite the Ministry of Defence being required to shed 32,000 staff. MEP Gerard Batten says money is being spent in foreign wars that should be spent at home. As money is spent on two wars in foreign lands, parts of London, Birmingham, Liverpool and Bristol are essentially ghettoes, partly because of high immigration, but also because young people in these communities have no prospects. They are bored and disaffected, and as the cuts bite, that is not going to improve. A Clapham youth worker, Eva Wynne, told RT that four out of eight youth centers have closed since last year. Tuesday night saw 16,000 police officers on the streets of London. According to the Metropolitan Police, the force is being stretched more than ever before. And increasingly, Londoners are talking about taking matters into their own hands. Bringing the situation under control is just the beginning of solving this problem. It is not just about cleaning up. It is about communities coming to terms with the fact that even at their current numbers the police seem unable to retain control of the streets if violence is widespread. A feeling of insecurity in these communities is likely to remain for some time to come, particularly if police keep disappearing from the beat. London journalist Ben Cohen believes that the main problem is the large number of people who feel completely alienated from society. “The rioting and anarchy that you are seeing in the streets of London is a product of that massive alienation,” he said. But Cohen also says that the riots do not come as a surprise with a prime minister who is has no experience of inner-city problems.